Today’s hint is tangentially related to OS X, in that it uses iTunes, but it will really be of interest only to Apple TV owners. One of my issues with the Apple TV has been the inability to easily organize my movies, leading to a long list of entries in the My Movies section of the interface. As of Apple TV’s 2.3 software update, however, that problem has been solved. You can now arbitrarily group movies into folders, just by adding a certain tag in iTunes. So instead of seeing the 19 separate entries for your James Bond movies, you can instead see a James Bond folder at the top level. Navigate into that folder on the Apple TV, and you’ll find the individual movies. To me, this makes the My Movies interface a lot cleaner and easier to navigate. To group your movies on the Apple TV, open iTunes and select the Movies library. Now Command-click on the movies you’d like to group into a folder, and then press Command-I to open the Multiple Item Information dialog. On the Video tab, put the name you’d like to use for your folder—James Bond movies or something similarly inspired—in the Show field, then click OK.
Now re-sync your Apple TV (in the Devices section of iTunes, select the Apple TV and click Sync) and you’re done. When you go to the My Movies section on your Apple TV, you should see your newly-created show. 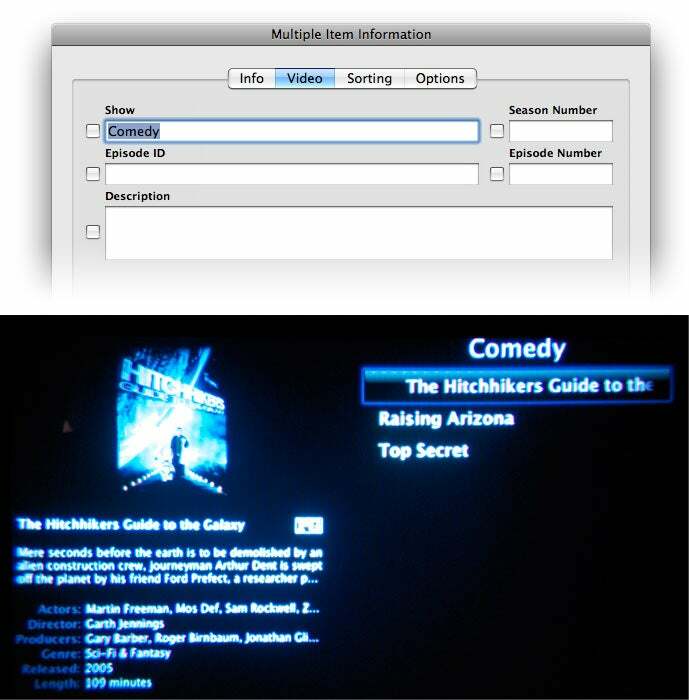 In the image at right (click it for a larger version), the top half of the image shows the Multiple Item Information dialog, and the bottom shows a (bad) picture of the contents of the folder on my Apple TV. With this simple change, my Apple TV’s My Movies section no longer feels like an unorganized mess…now it’s an organized mess!